Indie distributor Roadside Attractions has acquired U.S. rights to Edward Zwick’s drama about the Todd Willingham case, “Trial by Fire,” the company has announced, according to TheWrap.com. The film, starring Laura Dern and Jack O’Connell, was adapted by Geoffrey Fletcher (“Precious”) and is based on David Grann’s article in The New Yorker about the unlikely bond between a death row inmate (O’Connell) and a mother of two from Houston (Dern) who, though facing staggering odds, fights for his freedom. “Trial by Fire” had its world premiere during the 2018 Telluride Film Festival in August. Roadside plans to release the film on May 17. Former Texas DA sent Todd Willingham to his death. Now he’s on trial for misconduct, by Jordan Smith, The Intercept, May 2, 2017. Todd Willingham’s Prosecutor Goes on Trial to Determine if He Hid Evidence, April 25, 2017. Did the state of Texas execute an innocent man? FRONTLINE investigates the case of Cameron Todd Willingham. We left an empty chair for Todd Willingham on the dais on March 3, 2015 at the press conference with death row exonerees at the Day of Innocence at the Texas Capitol. After the press conference, we went to the office of State Senator Eddie Lucio, Jr to request that he file an historic first-time ever bill in the Texas Senate that would completely abolish the death penalty. On March 13, 2015, for the first time ever, and in no small part because of the case of Todd Willingham, a Senator Lucio filed a bill in the Texas Senate to completely abolish the death penalty. 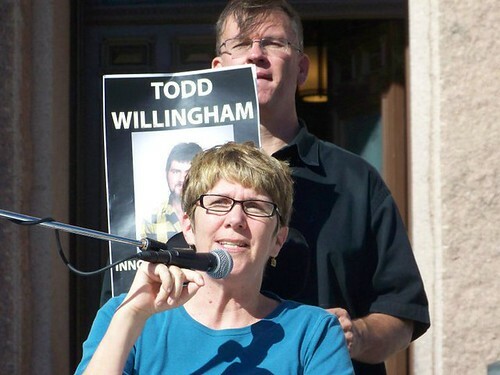 On March 10, 2015, more evidence emerged supporting the conclusion that Willingham was wrongfully convicted and that Texas executed an innocent man. 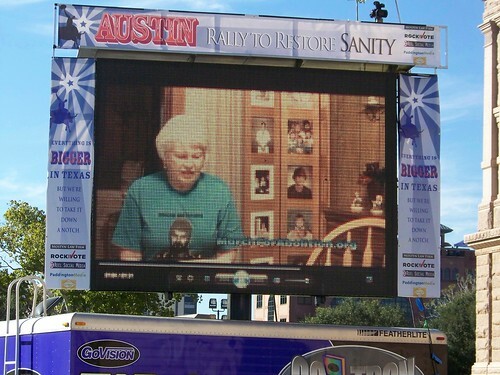 Eugenia Willingham speaking on the giant Jumbotron to the crowd at the 11th Annual March to Abolish the Death Penalty. Her remarks included reading an excerpt from a letter written by Todd Willingham. She said Todd’s dream was to abolish the death penalty and she hoped we could all work together to make Todd’s dream come true. The 11th Annual March to Abolish the Death Penalty was held in Austin at the Texas Capitol October 30, 2010. Elizabeth Gilbert also spoke at the 11th Annual March to Abolish the Death Penalty. Elizabeth is a Houston teacher and playwright who befriended Texas death row prisoner Todd Willingham. Her story is featured in the New Yorker article by David Grann about the case as well at the Frontline Documentary “Death by Fire” (Click to watch online). Elizabeth actively investigated the case on her own. She became convinced of Todd’s innocence and was instrumental in helping his family find an expert fire investigator to examine his case. Former Texas Governor Mark White on Todd Willingham: “If there’s no arson, there’s no crime, and, therefore, he is innocent,” reports Newsweek. Below is a video of Gov. White speaking to reporters after he delivered the summation of the case on behalf of Todd Willingham’s family at the Court of Inquiry on October 12, 2010. Read the full text of the petition filed with the Judge Charlie Baird’s court: “Petition to Convene a Court of Inquiry and for a Declaration to Remedy Injury to Mr. Willingham’s Reputation Under the Texas Constitution“. Court of Inquiry Hearing Sought to Exonerate Todd Willingham Lawyers for relatives of Todd Willingham, executed for the 1991 arson murder of his three young daughters in Corsicana, on Friday Sept 24, 2010 petitioned a judge in Travis County to hear evidence and determine whether Willingham was wrongly convicted. They sought to use the same process that resulted in an exoneration finding in another wrongful conviction case, Timothy Cole, who died of natural causes while still in prison before evidence surfaced proving that he was innocent. 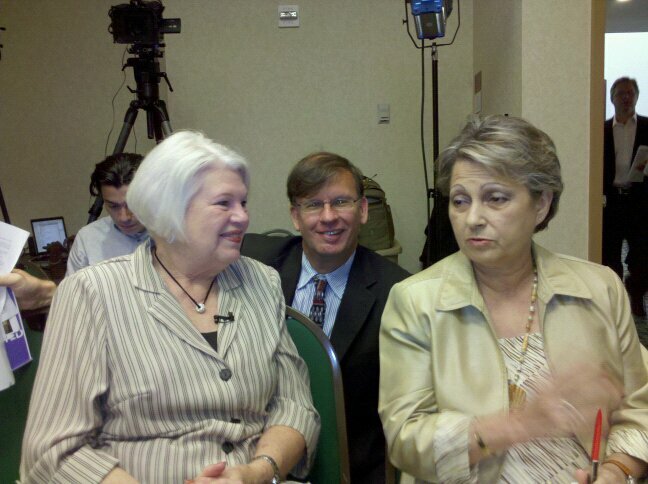 The Texas Forensic Science Commission met in Dallas on Sept 17, 2010. Todd Willingham’s stepmother, Eugenia, and two of his cousins, Patricia Willingham Cox and Judy Willingham Cavner, testified to the packed meeting. At the meeting, the Commission rejected a draft report written by Chair John Bradley and decided to continue the investigation. On November 19, the Commission will meet in Austin and hear live testimony from invited fire experts. Eugenia Willingham and Patricia Willingham Cox, who are Todd Willingham’s stepmother and cousin, also attended the meeting of the Texas Forensic Science Commission in Houston on July 23, 2010. Patricia Cox addressed the commission during the public comment period. They are pictured below with Texas Moratorium Network’s Scott Cobb. Texas Moratorium Network shot the video below of Todd Willingham’s cousin Patricia Willingham Cox speaking at the meeting of the Texas Forensic Science Commission in Houston on July 23, 2010. Click here to watch the video on YouTube. Or click here to watch it on the TMN Facebook page. Shout this name from the rooftops, Todd Willingham. He was innocent and Texas killed him. U.S. Supreme Court Justice Antonin Scalia, in 2006, wrote that, in the modern judicial system there has not been “a single case–not one–in which it is clear that a person was executed for a crime he did not commit. If such an event had occurred in recent years, we would not have to hunt for it; the innocent’s name would be shouted from the rooftops.” Take part in our “Shout it from the Rooftops” campaign. Sign the petition to Governor Greg Abbott and the State of Texas to acknowledge that the fire in the Cameron Todd Willingham case was not arson, therefore no crime was committed and on February 17, 2004, Texas executed an innocent man. Join the Facebook group Todd Willingham – Innocent and Executed: Shout it from the Rooftops. Call Governor Greg Abbott and leave him a message at (512) 463-1782. Todd Willingham was executed for arson/murder on February 17, 2004. He professed his innocence from his arrest until he was strapped down on the execution gurney. Now, we know for certain that he was telling the truth. On August 25, 2009, Dr Craig Beyler, the investigator hired by the Texas Forensic Science Commission to review the Willingham case, released his report in which he found that “a finding of arson could not be sustained” by a scientific analysis (Read the report here). He concluded that the fire in the Willingham case was accidental and not arson. In fact, there was no arson, so there was no crime. Texas executed an innocent person. The proven execution of an innocent person should mean the end of the death penalty in the United States. Governor Perry and the Texas Board of Pardons and Paroles had been given a report prepared by noted fire expert Gerald Hurst before the execution that cast doubt that the fire was arson, but they ignored it. Read documents obtained from Governor Rick Perry’s office and the Texas Board of Pardons and Paroles. The Innocence Project requested all documents concerning a critical report on the Willingham case that renowned arson expert Dr. Gerald Hurst wrote and disseminated to officials in both offices in the days before Willingham’s execution in February 2004. Read the report by Dr Gerald Hurst sent to Governor Rick Perry before Willingham’s execution saying that the forensic analysis that convicted Willingham was full of “many critical errors” and reaches “invalid” conclusions. Neither office has any record of anyone acknowledging the report’s contents, taking note of its significance, responding to it, or calling particular attention to it within the government. 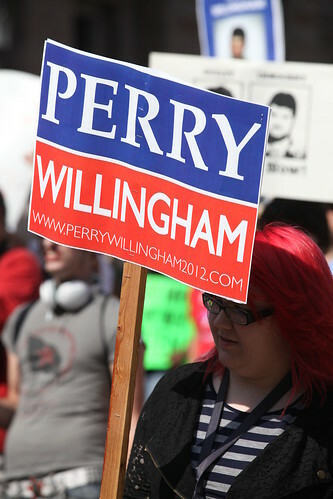 This lack of action indicates that in the days and hours before Willingham was executed, the Governor’s Office and the Board of Pardons and Paroles ignored critical expert analysis – new scientific information – that cast serious doubt on whether the Willingham fire was arson. In the Sept 7, 2009 edition of the New Yorker David Grann comprehensively examines the Todd Willingham case in which an innocent person was executed by Texas. The 16,000 word article examines every aspect of the case and concludes that there is no doubt that an innocent person has been executed. There is scientific evidence to prove that the fire was not arson. The New Yorker also has an audio interview with the author. Read the complete 1992 trial transcripts. Please read the entire article in the New Yorker.